Having a sister living in Edinburgh does not just provide the perfect excuse to visit this fine city, but also means free accommodation during the Fringe. For anyone who has looked into heading to the Scottish capital in August or has made it a reality, it is safe to say this should not be underestimated. With thousands of performers and audience members swelling the population throughout the month, finding somewhere to stay can be a difficult and expensive exercise. With my sister and her family away on holiday for ten days during the festival, my retired parents basically relocated to their house. Mum and Pops are huge lovers of the Fringe and see a wide selection of free and ticketed events every year. This worked out perfectly for me, as they had the time to go through the phone book-thick programme and work out an itinerary for my visit and book tickets - now that's service. There are occasions when you go and see something at the Edinburgh Fringe and it is only afterwards that you realise it was the funniest thing you will see all weekend and perhaps, all year. This was the case with Foil, Arms and Hog and their Skiddlywup show. Fresh from my train, we headed to the venue and took a seat. My parents had been in Edinburgh a few days by this point and were into Fringe mode, but I still had work on my mind and needed to relax. Foil, Arms and Hog was perfect for this. From their carefully crafted jokes and clever use of props to hilarious accents and audience participation, these lads had it spot on. They dealt well with an early heckler and involved other members of the crowd in a way that was funny, but not disrespectful - a difficult balance to achieve. One participant, Jake, was returned to again and again throughout the show to great effect. Jokes about bouncers going on dates, medical musical chairs and the comedic disappearance of Sophie Johansson were all highlights. Mum and Pops booked tickets for this year's show based on how much they had enjoyed their act in 2014. Take my advice: if you are in Edinburgh in August 2016 and Foil, Arms and Hog are performing, be sure to go and see them. You won't be disappointed. On previous trips up to Edinburgh and Manchester I have tried to see Austentatious - including when it first appeared at the Fringe and was a free show. It seems that third time is lucky and we managed to get tickets. This hilarious improv show is different each time and based on plot suggestions from the audience. Able to attract huge crowds at the Udderbelly venue, finally getting to see it was not a disappointment, with some of the laughs coming from the bizarre situations the unpractised nature of the show put the cast members into. 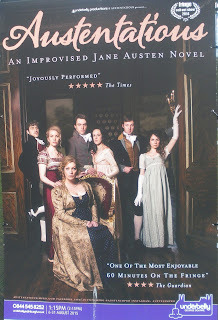 The "lost Jane Austen work" that one of the actors plucked from a top hat of suggestions was The Unicorn's Wedding. A classic tale of love between both the human characters and their equine counterparts. It's easy to see why the format has proven so popular and lovers of classic literature, as well as comedy, will get plenty of enjoyment from it. 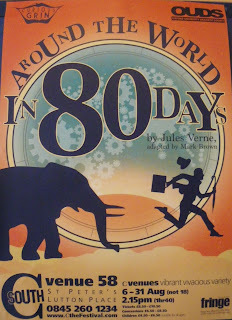 Oxford University Dramatic Society's (OUDS) version of Around the World in 80 Days was charming and innovative. Just eight actors portrayed all the parts, using various props to change the settings and their characters along the way. The highlight of the show had to be the appearance of a lovingly realised elephant, created out of an upturned wicker laundry basket, with fans for ears and a series of 45s strung together for its trunk. Plungers were pressed into service as the elephant's feet trudging along - very effective. Jimmy McGhie is more of the classic one-man stand-up that many people have seen before. While he may be one among many, he is still good at what he does. Much of his comedy comes from quite a dark place and a difficult relationship with his father, but while this may sound awkward, in reality it made it very personal and there were elements that everyone in the audience could relate to. 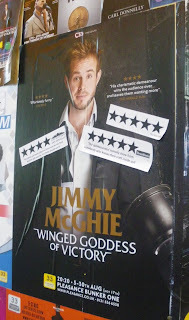 McGhie is another Edinburgh performer who knows what a strain doing the same show every day for nearly a month can be. He touched on this, but while obviously sticking to a well-planned overall structure, he bounced off the audience too. Whether it was the soon-to-be-father sat next to his heavily-pregnant partner or the woman who jumped in with a substandard punchline to one of his jokes, he got everyone involved and made the show unique. Being in Edinburgh during the Fringe is a fantastic experience, as the whole city swells to welcome some of the most interesting and talented people the UK and wider world have to offer. As well as the comedy, there are a lot of plays to see, music and street art all going on everywhere. The smallest and most obscure places are turned into venues - sheds, barges and camper vans - with something to see at every turn. The Edinburgh Book Festival is also on at the same time as the Fringe, with lots of events being held around that. Its marquees are set up in Charlotte Square and there is a lovely bookshop to browse even if you don't make it to any of the author speeches or signings. 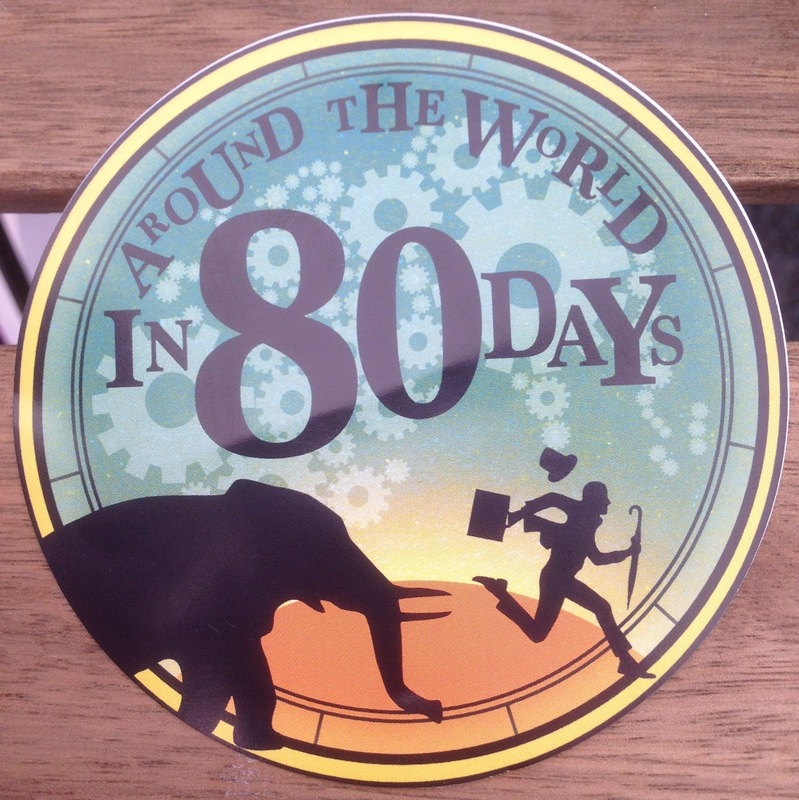 A trip to Mother India for dinner and a pint at the Bow Bar are the other two things that complete my must-do activities at the Edinburgh Fringe. It's an exciting time of year in the Scottish capital and one everyone should attend at least once. Just don't book too many shows too close together, as that can be exhausting. Factor in some wandering time and you will have an incredible visit.